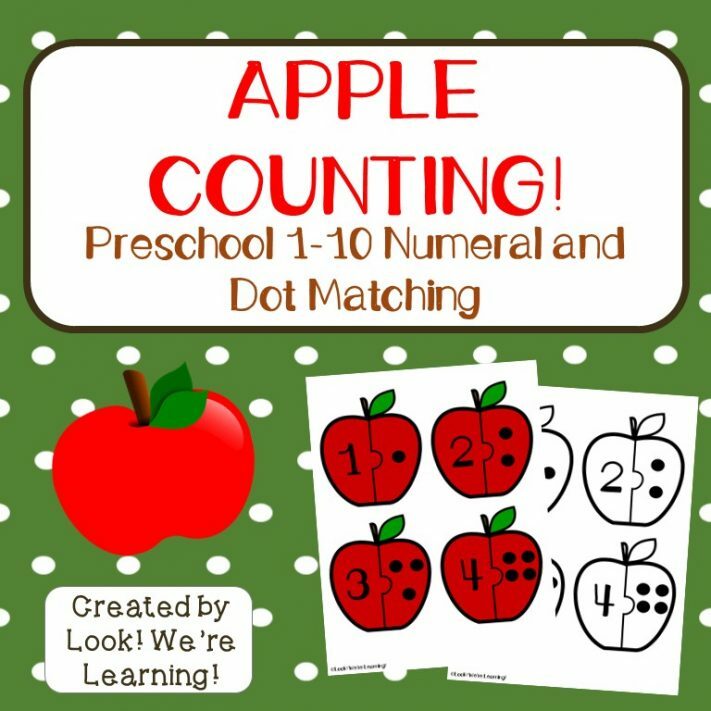 Apple Preschool Counting Puzzles - Look! We're Learning! Preschoolers absolutely love playing with puzzles. My four-year-old asks to do a puzzle almost every single day. The same one. Over and over again. But that’s a good thing! It means that kids are remembering how the pieces fit together to make a complete picture and solving them more quickly each time. 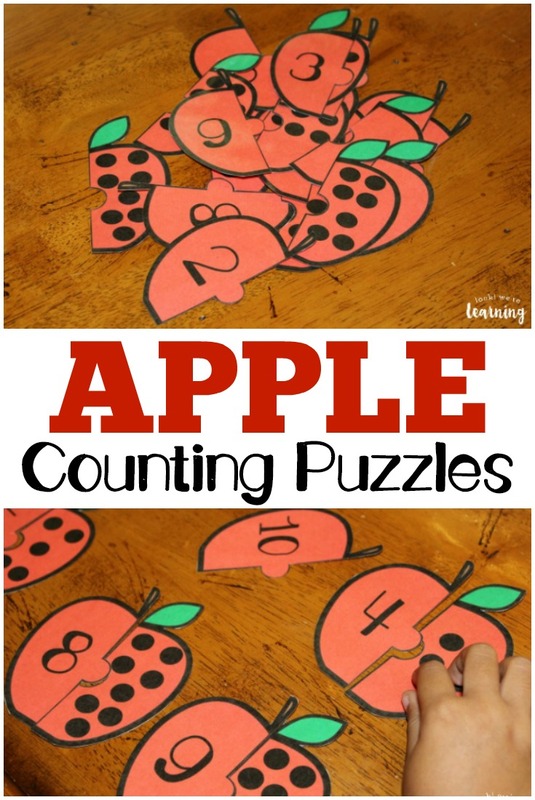 Since we’ve been working on recognizing one-to-one correspondence and counting individual items, I thought we’d turn that skill these Apple Preschool Counting Puzzles! 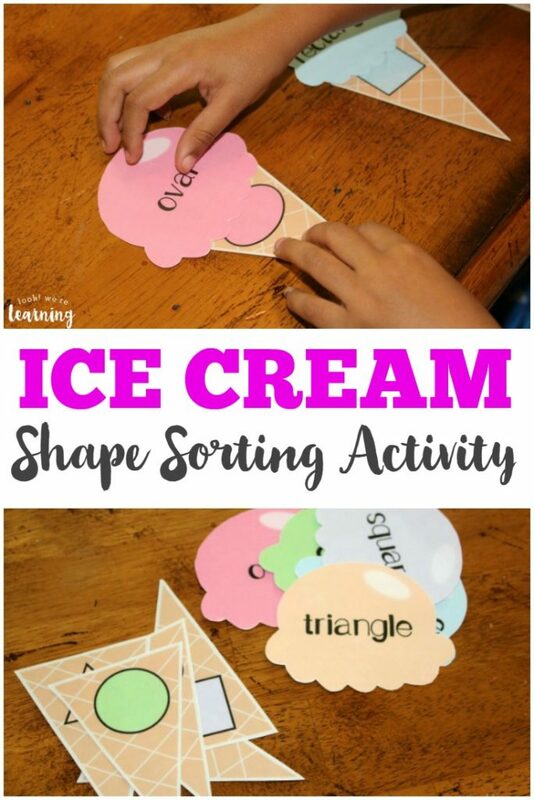 I was hoping that my little one would like this activity and she loved it! 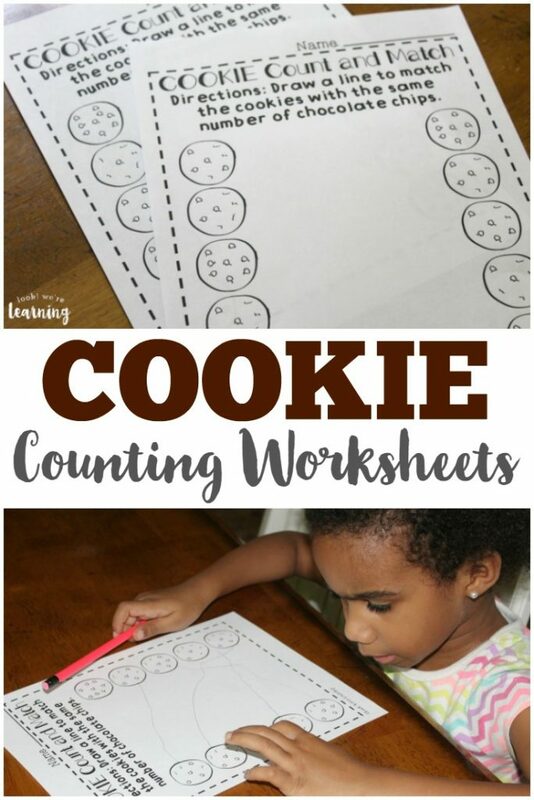 Read on to see how to share this hands-on counting lesson with your students! 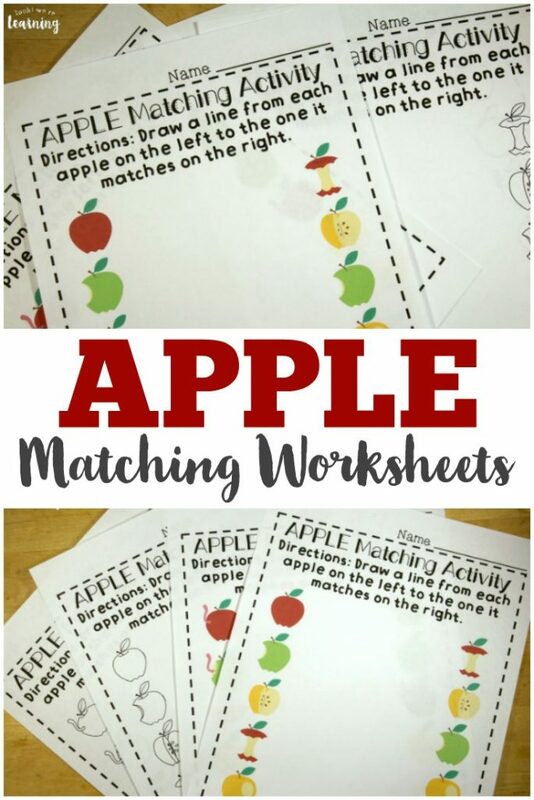 Also – if you’re looking to build an apple unit for preschoolers, don’t miss our other apple fun, including our Apple Matching Worksheets and our Apple Coffee Filter Craft! 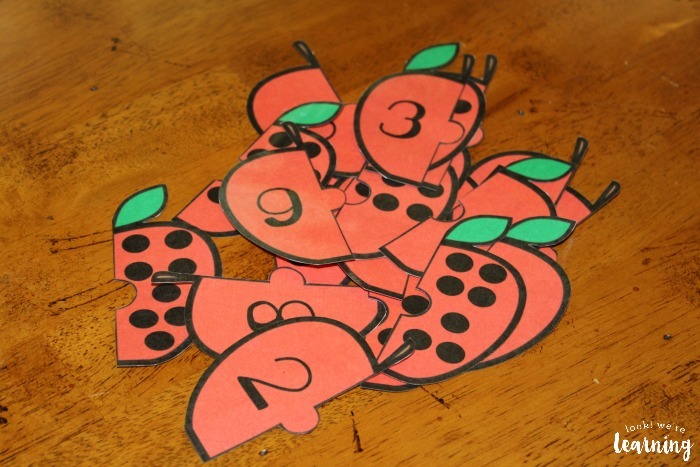 These apple counting puzzles include numbers and individual dots from 1 to 10. 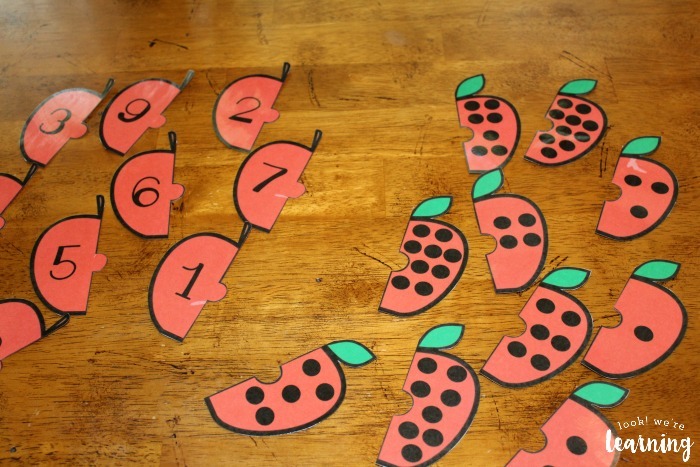 Once you laminate them and cut them out, you should have ten “dot” halves and ten numeral halves. By the way, if you’re short on color ink, a black and white line art version is included. That way, you can let the kids color in the puzzles themselves. Now the tricky thing about these puzzles is that they all fit together. 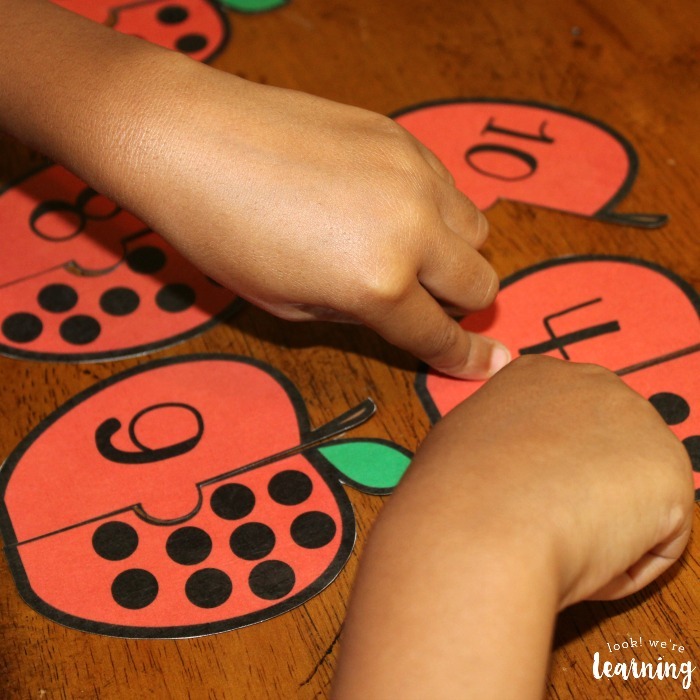 So the challenge for kids is to make sure that they’re matching halves based on corresponding the numerals to the number of dots on the halves. With Piglet, we focused on identifying the numeral first. Then we counted the dots on halves until we found the one that matches each number. When we finished, she asked “Can I do it again, Mama?” The surefire sign of a successful preschool lesson. 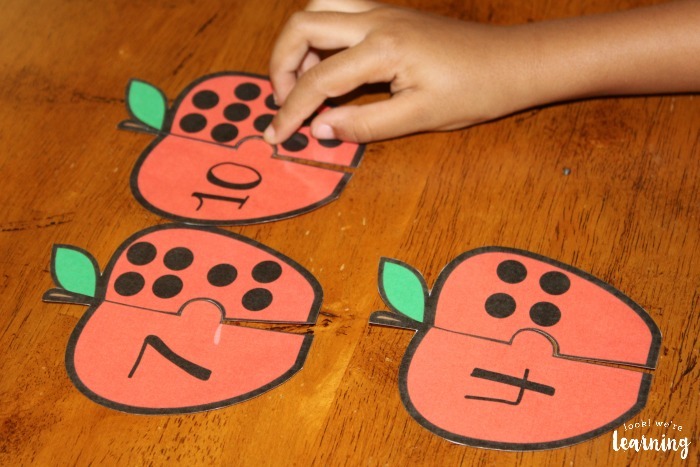 Scroll down to get your copy of our Apple Preschool Counting Puzzles! 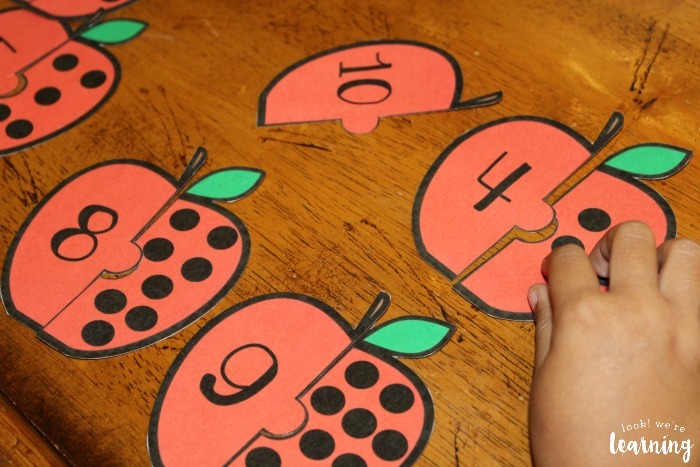 Don’t miss these other preschool learning ideas! And see more ways to make learning fun for early ages on my Learning for Little Ones Pinterest board! To get your copy of our Apple Counting Puzzles, click the image or the link below to visit our Store!